Inspire people not to be silent - either Vote, or Vote None. These posters are positive and party-neutral, so they can and must go everywhere! The leaflet makes the case. Hand it out in busy public places, and/or door-to-door. Note: the leaflet and posters do NOT indicate your own intended action. So you can display them and deliver them if you are Voting, or Voting NONE, or still unsure. They are also OK to deliver with other political leaflets and posters. The option to Vote or Vote NONE gives everyone a reason to participate in this election. Explanation on one side and small poster to display on the other. Print as A4 1-sided, or 2-sided to cut in half. Hand it out in busy public places. With explan­ation. Perfect for noticeboards, shop windows and public places. Poster: 'No one to vote for? Don't be silent…'. It shows how to Vote NONE, along with the brief explanation of what it means. 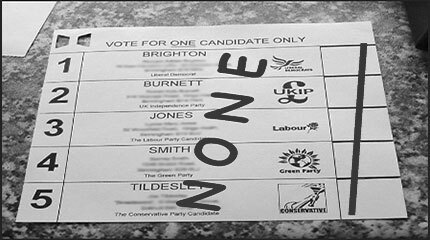 Poster: 'No one to vote for? Stay positive… Vote NONE'. Includes the brief explanation. Personal statement: 'Yes, I will either… Vote or Vote NONE.' Declare you're doing something, and raise aware­ness of the option. All print easily - black ink, white paper and any printer.